I'm getting ready to start on some major installs today and I'm just going over the plans and drinking coffee before I get started. And I'm confused about something. Please see picture below. Most connections are pretty straightforward here, but I really don't understand the black ground wires. How do I connect them? 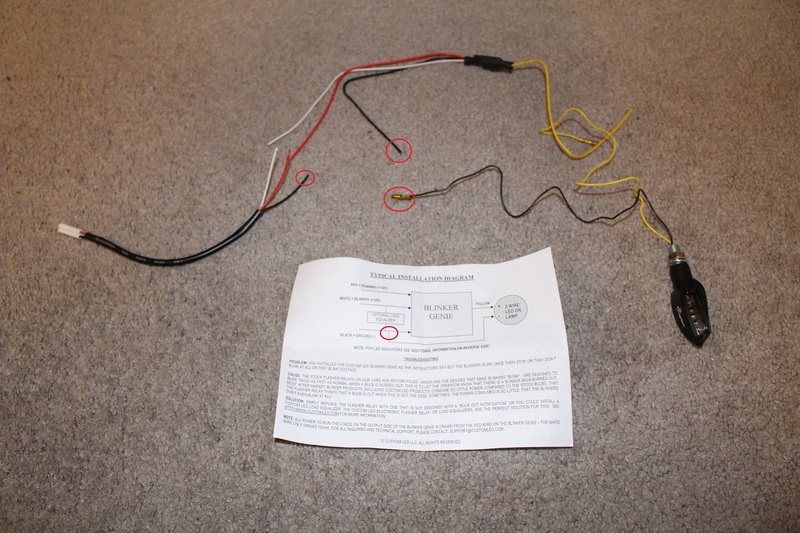 You can see the instructions for blinker genie in the picture, and there's a three way connection I've highlighted. And the three wires involved are highlighted... But how do I connect them?? Just solder them all together at the same connection point? Sorry if this is a dumb question! Never really worked on wiring like this before, and the idea of having a three-way connection like this doesn't make sense to me. I just 3-wayed it. Not sure if it was necessary to do it that way, maybe someone who is more knowledgeable with wires will have better info. And by 3 way, I mean I soldered all 3 ground wires together. Been running it that way for over a year now. And make sure to do some test runs. Ride for 10-15 minutes, pull over and touch the signal with your bare hand. And eventually try for a one hour plus ride and do the same. Just make sure your housing doesn't melt from too much heat is what I'm getting at. I did this exact combination months ago, Blinker Genie with light tech signals, it worked perfectly for a month then the led's started to stutter and "blow out" 1 led at a time until the whole signal would not work anymore, i would advise not using this combo if you don't want to replace signals every month or so. As for your question, you just have to wire the 3 black cables together and done, it makes sense because you are adding a blinker genie into the mix, you need the 3 wire negative setup for it to work. Hope this helps! ^ I guess it really depends on whether you bought cheapie LEDs or not. But I won't argue with the fact that your LEDs will eventually just blow out over time. Like I said, mine has lasted over a year, but I'm using expensive italian ones (nearly 200 per pair). I can see 17 dollar ebay specials getting busted in a few hours of riding. These were not cheap led's they go for 60-70 bucks a pair, i had to contact the manufacturer to get a replacement, it was hard and not worth doing it each time they blow out. Read: Your mileage will vary. What is the reasoning behind using a Blinker Genie? From what I read you turn your led signals into DRL's but your headlight is always on while driving so I doubt it will add any safety. And apparently you run the risk of burning out your turn signals within a year. Is is just to be legal? Save yourself some money (and leds from burning out) by making your own blinker genie. Use resistors to lower the voltage for the drl input vs having them at full brightness 100% of the time. I've got a diy posted if ur interested. What @duenan said. Connect all 3 found wires together and cover them up. I installed the Cyclops LED bulb instead. If they do not see that coming then two little yellow lights will not help. I like the idea of running lights. 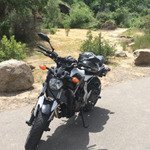 More visibility, more perspective from on coming cars that you are a motorcycle, and gives some distance clues that aren't there without. I always worry that one headlight seen by an inattentive driver could not give the distance clues as easily and cause them to think they can do that left turn that we love so much. Maybe I'm just paranoid, but IMHO more lights are better. I cannot argue with your logic, @rowdy, but I think you would be better off with a couple of white driving lights instead (or as well). I'd say if you're that concerned about the DRL's then it would be worth the extra few dollars to buy the DRL ready signals and drop the head ache of dealing with extra wiring and burning out already expensive lighting. I've been thinking of adding those too! You are absolutely right with this. This is exactly why I didn't want to give up the running lights. The two amber lights on either side of your headlight help other drivers immensely with judging your speed and distance. By the way, thanks for this response! I hooked them up as such and everything works perfectly. I should've planned out the wiring a bit more though. I had lots of excess and I just had to bunch it all up and stuff it behind the headlight mount. Probably could've shortened the wires and made it a lot cleaner. Oh well. This is the wrong way to do it and is precisely how you burn out LEDs. LEDs should always be run at full voltage, it's bad for the LED to run less than full voltage. Dimming of LED's should be done with a Pulse Width Modulator (PWM) which is basically digital dimming. If you've seen LED's in videos that appear to be flashing, it's because they are. LED's are dimmed by modulating the voltage going to them extremely quickly, flashing them on-and-off very fast and appearing dim. Meh it'll be fine, pulse modulator just cycles on and off faster than the led can reach full brightness-it's just a more effective dimmer but both are acceptable. The voltage difference from dim to bright is very small. 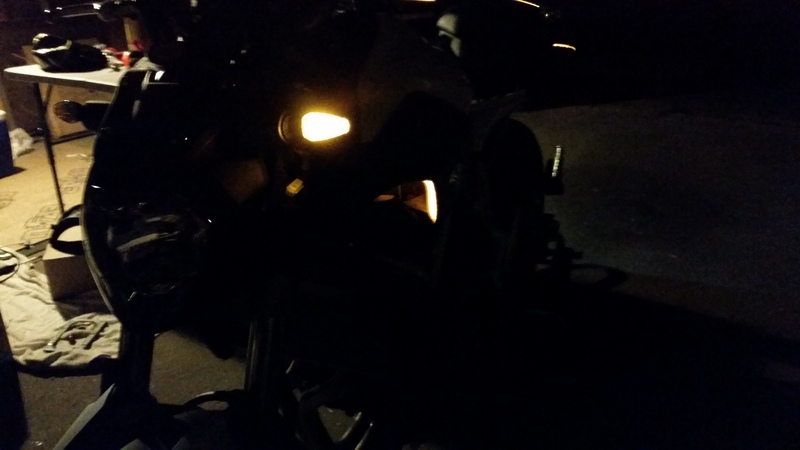 What burns them out is when the LED manufacturer didn't take into consideration the voltage increase when the bike is running and your running them at a higher voltage than designed for 100% of the time (blinker genie). Don't forget LeDs run at 2.5-3.5 volts and rely on resistors to drop the voltage down. Even a lot a cars use variable resistors so you can dim the LEDs lighting up every button/gauge on your dash. 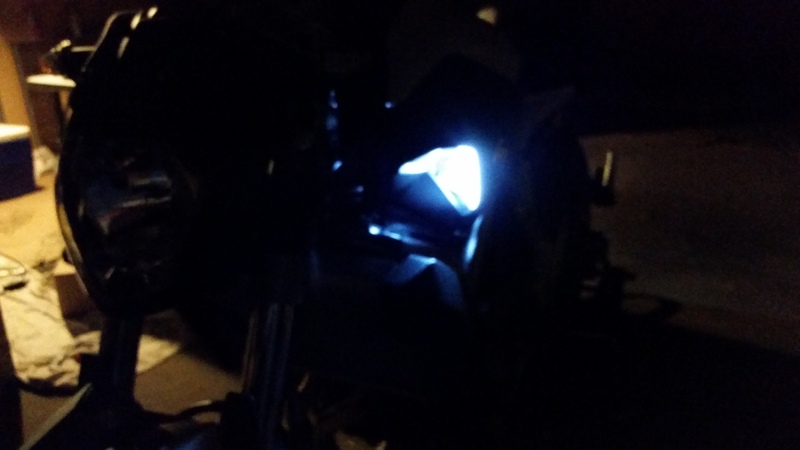 For those of you transforming your FZ-07 front lights... be sure to purchase two things from Custom LED... first is the Blinker Genie... second is the flasher relay (ELFR-1 Electronic LED Flasher Relay with OEM Connector). The relay takes care of the hyper flash without all the resistors... the blinker genie gives you the running lights and converts a two wire system to the three wire for running lights. Super easy to install both items... you can look up how to do it on YouTube. That's what I did! I like the fast blink, I feel like it makes me more visible.